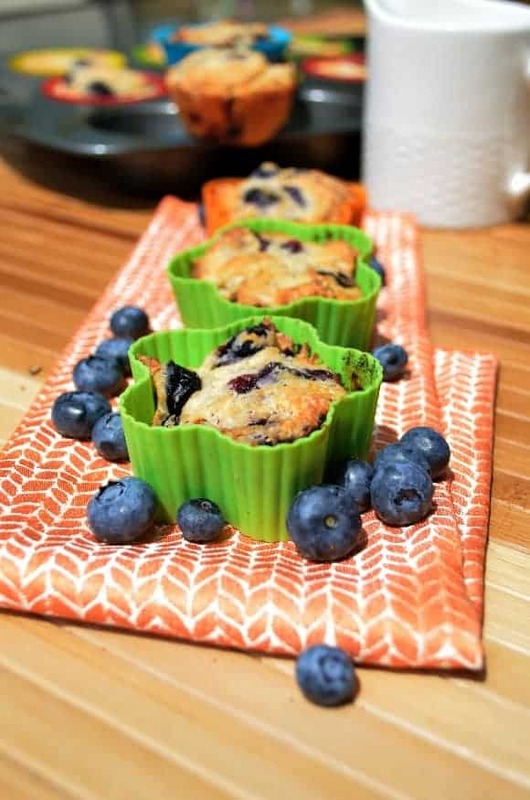 For today’s blueberry recipe, I will be sharing this healthy blueberry muffin recipe. I replaced some of the fat with Vanilla Greek Yogurt. As you may have noticed, I love cooking with Greek Yogurt: either in a smoothie recipe or in these greek yogurt muffins. Greek yogurt is an easy way to create a healthy recipe out of one that is kind of fatty. Best of all, you don’t lose any of the delicious taste in this blueberry muffin recipe! 1/2 cup of sugar. I used a natural sweetener. Then add dry ingredients to the wet ones. Fill in the muffin tins. I usually fill it to the top. 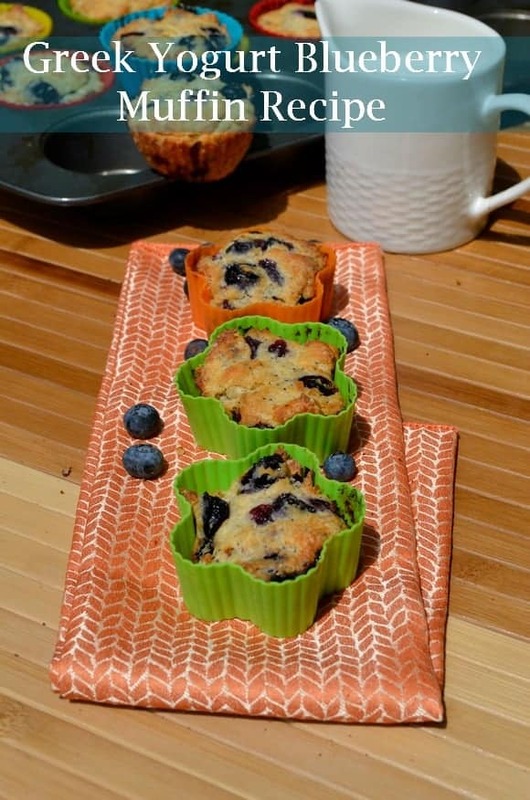 I used the silicon muffin tins as I find them easy to clean and eco friendly. It sounds like a lot of ingredients, but really, this blueberry muffin recipe is pretty easy to make. For the sweet tooth, you can dip them in some maple syrup. It will moisten and soften it a bit. But be careful for sticky hands. This recipe can be a great addition to your child’s lunch box or as an after school snacks or after those summer sport activities. Make sure to wrap them properly and they can be stored for 5 days at room temperature. You can even cook a double batch and freeze them in individual portions. The taste won’t be the same but it is handy for those days you don’t want to bake or you don’t have the time to (or both). Looking for more blueberry muffin recipes? Check out our Blueberry Muffins with a hint of lemon! It’s not quite as much a healthy recipe as this one, but it is delicious. Don’t forget, we’re celebrating Blueberry Month all week long. Check out our favorite blueberry smoothie recipes and low-calorie blueberry pies! For more blueberry recipes, check out our Pinterest board. Follow OurFamilyWorld Magazine’s board Blueberry Recipes on Pinterest. Yum! I love blueberry muffins, but I never tried them with yogurt! YUM! Definitely going to try this recipe next time I make Blueberry muffins. LOVE your little muffin cups too! So cute. I am definitely going to try this using stevia sweetener instead of sugar to make it extra healthy, thank you! I love blueberry muffins! I like that this recipe is healthier with the limited sugar and whole wheat flour. I like the fancy shapes. The muffins sure look yummy! This recipe sounds yummy, we definitely have to try it! Thank you so much for this recipe! I bet these are super tasty! I just purchased some fresh blueberries so these are definitely going to be made! that looks absolutely gorgeous! we love bluberries fresh and baked so thank you for sharing the recipe. we will sure try as it’s perfect for summer picnic by the park! These look SO good! I love the fun shapes and so would my kids. It’s like you KNEW I was wishing for a healthier blueberry muffin recipe today! We had to leave early to go to our family reunion this morning, so we had bought some big blueberry muffins. They were delicious, but I cringed with every bite thinking about the calories. Muffins are my favorite breakfast food, and this recipe will definitely make me feel less guilty about it. It’s looks delicious too, so I won’t even have to feel deprived while I’m not feeling guilty. Oooo…yum! These look delicious! And I love the muffin tins that you used. I haven’t tried blueberry muffins with yogurt, but I can imagine it is a healthier alternative. Wow, those look delicious! I bet they are much more moist with the yogurt added. I’m curious, what natural sweetener did you use? I try my best to use honey instead of any other sugar/sweetener. These look so yummy and I love the cute shapes! These look amazing and I will have to try to make them. I love blueberry muffins. Thanks for sharing. Oooh, these look great! Blueberry muffins are one of my standard “Company-best” breakfasts to make 0 I’ll have to try them with Greek yogurt sometime! Those shapes are wonderful. Blueberries are definitely my favorite berries ever, so I’ll make this recipe vegan and treat my family. Thank you! These do look really good 🙂 Love the cute backing tins too. These look really good! I want some of those funky muffin shapes!